Oxfam has said that a scheme to provide improved access to malaria medicines is actually endangering lives and should be halted. The charity said that the Affordable Medicines Facility for malaria (AMFm), which is managed by The Global Fund To Fight AIDS, Tuberculosis and Malaria, is a “dangerous distraction from effective public health measures”, with drugs being distributed by unqualified shopkeepers rather than healthcare professionals. The scheme, set up in 2009 through nine pilots in eight countries in Africa, involves drug manufactures offering their malaria products at reduced rates in developing nations. The AMFm then subsidises the majority of this cost, so both private and public retailers in each nation can buy treatments at a fraction of their initial cost to then sell on to the general population. 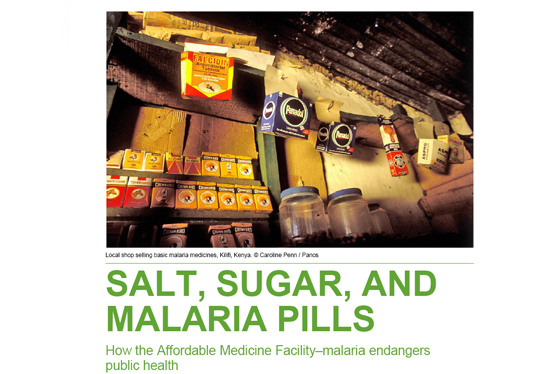 However, it is this use of the private sector to sell on malaria drugs that has caused concern for Oxfam, with the charity suggesting in its report Salt, Sugar and Malaria Pills that this includes 'street vendors, market stall-holders and grocers – people without medical qualifications who are motivated by commercial interest, not public health outcomes'. These traders lack the ability to diagnose correctly and supply treatment for malaria said Oxfam, with the charity citing studies that demonstrate 60 per cent of fevers in sub-Saharan Africa are not down to malaria, illustrating a high potential for misdiagnosis. Dr Mohga Kamal Yanni, Oxfam's senior health policy advisor, said: "It is dangerous to put the lives of sick children in the hands of a shopkeeper with no medical training and to pursue a scheme that doesn't help those people who need it the most." In addition, Oxfam also criticised the idea of asking people to pay for malaria medicines, saying the scheme still excluded the poorest populations. There was also no concrete evidence the scheme was effective at saving lives, said Oxfam's report, and that there were no measures in place to quantify the use of the drugs by vulnerable populations at most in need of malaria treatments. As reported by the BBC, the Global Fund defended the AMFm, saying some aid groups were opposed to private sector involvement in such schemes. "But the reality of this programme is that it is getting life-saving medicine to people who need it most from the private sector outlets where they already seek treatment,” said the Fund. “Before the launch of AMFm, life-saving malaria treatments cost up to 20 times as much. An extensive study has shown that AMFm has increased availability and reduced prices for high quality anti-malarial drugs." The future of the AMFm will potentially be discussed at the next board meeting of the Global Fund to Fight AIDS, Tuberculosis and Malaria on November 14 and 15, when Oxfam said it hopes the scheme will be brought to an end.